As with reviews, ignoring or reacting to questions are not the best strategies. Instead, it is critical that you promptly engage consumers by both asking questions and providing answers. Develop a strategy of engagement with a Q&A that allows you to participate in the conversation constructively. The key to a successful strategy is minimizing the downside by monitoring and reporting violations, while maximizing the upside by seeding meaningful questions, becoming the authoritative source for answers and responding quickly to customer questions and concerns. Below is our recommended process, which is summarized in five words: Plan, Post, Monitor, Respond and Report. It is entirely within Google’s guidelines for a business to ask and answer its own questions. 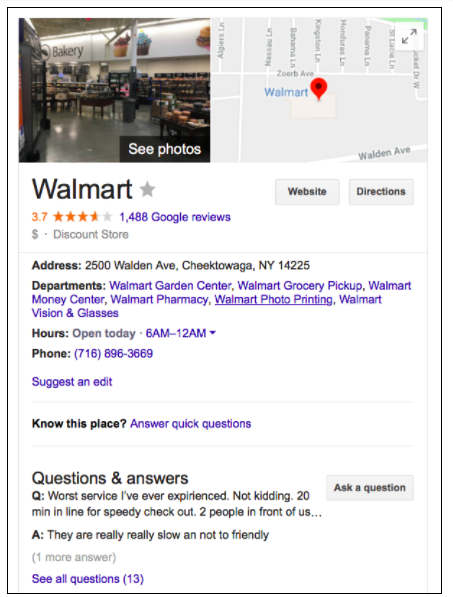 The first step is to figure out what questions consumers are asking and which would be useful to facilitate the customer journey from search to your business. The obvious candidates are concerns about parking, special hours of operation, appointments and other conveniences. After the obvious consider any questions a consumer might need answered before using your services. What are common questions when consumers call you? What are common questions from contact forms, Facebook messenger, etc.? What are sub-services or offerings unique to your business? For more vertically-focused boutique businesses, it makes sense to clarify as much what you don’t do as what you do to qualify potential customers properly. It’s perfectly acceptable and smart for a business to “seed” their own Questions & Answers. After you decide which questions and answers are most appropriate, take some time to write them out, review them to make sure they meet consumers’ needs and then get them posted. Taking this action will give the early postings a chance to be up-voted more over time. It can also help limit the opportunity for mischief by providing great examples of the content and format of the feature. 1 – Include questions for less well-known products and services. Once you have identified the low hanging fruit, brainstorm ideas for questions and answers about some of your less well-known products or services. “Does this bakery offer gluten-free choices?” is one example. Do not treat this as a keyword spamming opportunity. But going niche can be helpful to separate your special services from competitors. 2 – Plan for scanning. The web itself is built on quick, “scannable” reads. Consumers are a busy lot, so be sure that questions are easy to read and answers are brief but accurate. Elaborate questions or answers will be ignored or bypassed in most situations. 3 – Write questions using your customers’ voice. These are meant to be accessible and easy to understand – not marketing pieces – so ask questions the way you think your customers would. If your tone is one of sales and marketing, it may fall short for the consumer. 4 – Make them useful to both parties, your business and the customer. Even though you write a question in the customers’ voice, answer it in yours. After all, the goal is to facilitate interactions between your target customer and your business. 5- Don’t overdo it. While there is no magic number, fewer questions and answers are better than more. 6 – Encourage up-voting. Ask loyal customers to up-vote your questions and answers to ensure they are the most popular and stay at the top of the list. Be very aware of your top rated question as it receives more visibility in the Local Knowledge Panel. Actively Monitor Q&A For Updates And Up-votes. As noted, Google is not yet offering GMB alerts or API monitoring, which means that you must conduct monitoring activities manually or subscribe to GMB+ for its new monitoring solution. GMB+ provides email or text notification of new questions and answers so that business owners can easily monitor new “incoming” content. Assign a staff member to monitor the Knowledge Panel in Google Search and Maps for new questions and respond as the business owner by logging into Google using your GMB account credentials. No one can answer questions with as much authority as you, so screen questions and answers carefully and continue being part of the conversation. Quickly responding to new questions will help keep others from posting incorrect answers, whether they intend to or not. All too frequently, Local Guides will answer with a simple yes or no and, often as not, inaccurately. That’s why becoming the authoritative source for right answers is essential. It only takes ONE vote for a question to be eligible to show on the front page of your brand search or in local search results — and it just takes one vote for an answer to that question to do the same. Thus, the system is vulnerable to gaming and competitors up-voting questions or answers that could negatively impact a business. The next example is not what any business would want showing in their Knowledge Panel results. To be clear, we are talking about reporting questions and answers that violate Google’s terms of service (TOS), not a report of data from the feature. We know that in any social environment, users will typically mirror the sentiment that is already there. If there is a negative vibe, others will likely reflect that in their comments. Likewise, if the attitude is positive, users will generally follow that lead. It is not only essential to get out front by writing and posting your Q&A but also by staying on top of the content and reporting anything that violates Google’s TOS. With active monitoring provided by CKREU, you can take action quickly to get irrelevant and inappropriate questions and answers removed. Google can take things down flagged as incorrect automatically. For example, if someone answers a question and includes a phone number, email address, URL or certain proscribed words, Google will detect and remove it. Given the lack of a Google My Business posting API, some organizations with many locations will struggle with the posting aspect of this plan. As the number of locations increases, it will become more and more difficult to post questions and answers to all of your locations. You can outsource certain aspects of the plan — such as posting of questions and answers — to an agency, to make this easier. Minimally, even if you make the decision not to post your own questions, monitoring, responding and reporting are critical activities that allow your locations to stay ahead of the conversation occurring on the Knowledge Panel. You cannot opt out of Google Questions & Answers, so the best strategy for you as a multi-location business owner is to get out in front and embrace it. Like Google Reviews, this new feature gives you yet another free channel where you can interact with your customers. To take the hassle out of managing Google Q&A and turn it from a brand hazard into a business-building asset, CKREU developed a process as part of our GMB+ plan that help business owners and multi-location businesses easily monitor, report and productively engage with the new Google Questions & Answers. If you currently have a GMB+ plan, we are already monitoring your Google Questions & Answers. For new accounts, as soon as your locations are added we will automatically start looking for Google Q & A content. Email/text alerts. Whenever we find a new question or answer on any of your locations’ Knowledge Panel, we will alert you via email or text message so that you can respond. Be seen by customers at the very moment they’re searching for the product or service you offer. CKREU offers complete marketing research, strategy, planning and placement in Cincinnati, Ohio and surrounding areas. Our passion is to develop & implement targeted marketing campaigns that grow your business, your brand and your products. Delivering integrated marketing solutions that are creative, effective and budget friendly. Proudly serving Butler, Warren, Clermont and Hamilton Counties.